The state owned national carrier Air Jamaica has been getting a lot of attention as the country grapples with what to do with the perennial loss making carrier during testing financial times. Will we fly united - or American? Since it began operating in 1968, it has experienced its share of expansion and contraction and only once recorded an operating profit in 1986, equivalent to $6.8 million on revenues of $115.4 million. And the trend of loss and indebtedness is expected to continue through 2010. Originally started in 1963 as Jamaica Air Services initial shareholders were the government of Jamaica (51 percent), BOAC in association with the Cunard Line (33 percent), and BWIA (16 percent). BWIA’s employees in Jamaica were transferred to the new airline. The arrangement continued until 1968 when the government decided to partner with Air Canada (40 per cent) although the operating arrangement with BOAC and BWIA (aircraft) did not expire until 1969. With the national economy in shambles, the government has turned to the International Monetary Fund (IMF) for help, but a condition of the US$1.25 billion loan approved last week is that, loss making state enterprises must be divested, Air Jamaica among them. No government should be in the business of owning and running an airline. A government’s primary duties are (and should be) to protect its citizens and to establish rules and regulations by which society and the various sectors within it operate/function. In selling the airline it should be understood that any potential owner will be on the hook for all future obligations unlike in the past where debt incurred under private ownership was passed back to the government who reacquired control. In the later 1980/early 1990s, a merger of Air Jamaica with other Caribbean airlines was proposed by CAICOM tourism interests fearful of the growing dominance of and dependence on American Airlines. British Airways was invited to take a 25 percent holding in the venture. In the first stage, Air Jamaica was to have merged its operations with those of Trinidad and Tobago Airways, parent of BWIA. Bahamasair, Guyana Airways Corporation, and Leeward Islands Air Transport (LIAT) would be included in the venture later. Since then measures such as cutting back on service and routes has not made Air Jamaica anymore profitable. A merger of these three airlines still seems a good idea with the private sector being the majority owner and employees the rest. This merged airline would have hubs in Trinidad, Jamaica and the Cayman Islands and would connect the English-speaking Caribbean with the rest of the world. It would also be in a much better position to compete, in just about every aspect, with other foreign (i.e. non-Caribbean-based) airlines that currently serve the Caribbean. There would also be the synergies and economies of scale to be realized in such a merger. The drawbacks would be personnel issues such as pilot seniority and possible layoffs and the sentimental/nationalistic feelings they would engender as witnessed in the Jamaican and Trinidadian news media over the current merger proposal of Air Jamaica with Caribbean airways to meet the IMF condition. Some folks fear that without a national airline Jamaica would be at the mercy of foreign-based airlines. With all the cutbacks in service and routes, Jamaica is now, more than ever at the mercy of these carriers which fly in most of its tourist traffic – a fact not lost on the Tourism Minister, Ed Bartlett. 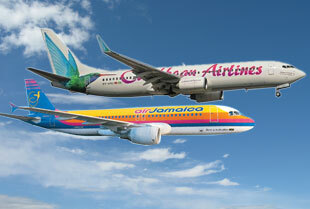 The truth is that whatever happens, Air Jamaica will cost some serious money. Any potential buyer will be reluctant to take on the debts and the government will likely never realize a profit if it were to sell the airline. One can draw a parallel between the Jamaican government trying to sell Air Jamaica and a homeowner who’s ‘under water,’ when the balance on his/her mortgage is more than the house is really worth. To those worrying about redundancy costs should Air Jamaica go out of business, look at what it has cost taxpayers to keep it around – not exactly chump change. The inconvenient truth is that the Jamaican taxpayer should not be asked to continue throwing good money after bad. The option of letting the employees become the owners of the airline could be explored. However, this demands more than enthusiasm and sentiment by them and their supporters. So, they line up the financing to buy Air Jamaica but, in these demanding economic times, can they still rely on the largesse of the investment/financial community to continue to provide financing if there is no sign of a profit in the immediate future. The other option is for Air Jamaica is to wind up its operations. At a time when we all want to see government be a better steward of our finances, asking that it to support money losers on one hand and spend to take care of society on the other simply cannot continue. Air Jamaica’s debt exceeds a billion US$. No one would take it for a penny if they have to assume the debt. Some with whom we have negotiated in the past wants us to ban the low fare airlines. How could that be in the interest of tourism? As I understand it, the Digicel executive who wanted to start (or perhaps have by now) his low fare airline with its main Hub here was not allowed to because of the “delicate negotiations” be carried out at the time by Wheby. When Sagicor was selling the Sans Sousi to Lee Issa, I recall asking Richard Byles why. I recall him saying that a single hotel hardly makes sense and a single small hotel makes less sense – just not enough rooms to dilute the fixed costs and the massive advertising. Air Jamaica is like that. Who assumed the losses sustained when Butch and the Moo-Young family “bought” it? Omar took it back for $1.00 and assumed the debts. It looked so bad that Butch eventually gave him US$20 mill – we understand. Will we be hearing that the Govt. did this for Butch, therefore it’s only “fair” that it does the same for the pilots? I think we should just close it down and stop the hemorrhage – US$150 million per year. Let the market do its magic and if we must subsidize, then let it be cost justifiable. Selling it with promises – implicit or explicit, may very well incur a contingent liability in more ways than one and may very well result in airfares that are higher than they could/should be.. Following a range of discussions during the Christmas season, I came to the conclusion that JA is in dreamland when it come to managing troubled assets and resolving critical issues. Many loose sight of reality and readily drop common sense to cling to false spiritual/religious dogma or try to argue concepts (e.g., macro/micro-economics) for which they only have a cursory understanding. For instance, it should be clear to any reasonable person that if you continue to spend more than you earn, that you will eventually be in great debt. Unless the overspending is for carefully planned growth, the solution should be to cut spending to achieve breakeven or surplus levels. However, we let smooth talkers and politicians evade the facts then sell us out as we sleep. The JLP government is obviously seeking a deal that will maximize the inflow of foreign currency at the risk of loosing a national asset that can be profitable, which clearly supports the formal and informal economy. Hence, it conveniently will ignore offers/solutions by local JA investors and seasoned professionals who have the ability to turnaround the airline at no major cost. What the JLP government wants us not to see is that selling Air J or its routes and hubs to a foreign entity will attain a very short-term benefit (like a narcotic fix) but in the medium and long term, will hasten the downward spiral of the JA economy. In other words, they are cutting our throats to spite their nose. Perhaps training in Operations Research is needed here. If other regional airlines that have a smaller market base can survive and be profitable, then the “Love Bird” can rise from the ashes like the Phoenix once these jokers’ hands are off its neck. Stan, I believe the three choices Air Ja. have are: a) merger; b) sell it to the pilots, et al; and c) shut it down permanently. My point is that the Jamaican gov’t simply cannot continue to financially prop up Air Jamaica in these times when it’s hard-pressed to find money to address other issues in society. Therein lies the conundrum: sell it, less the debt, and you might get decent money for it or sell it and let the buyer assume the debt as part of any sale and then you’d literally be paying the buyer to take it off your hands. In either case, the gov’t can’t possibly expect to profit from selling it to anyone if you factor in the debt AJ is carrying. Shut it down and then you have redundancy payments and pensions for vested employees. No matter how one looks at it, operating Air Jamaica has been and continues to be a costly proposition. Folks clamoring for it to be sold to its employees are doing so more out of emotion and sentiment and, dare I say it, jingoism – things that should not factor into rational business decisions/transactions. Gee, Richard, I’m surprised it took you until this past Christmas to realize what most Jamaicans with half a brain already knew about government management of troubled assets and resolving issues. If you read Stan’s response, you’d see where he talks about a former Digicel exec who wanted to start a low-cost airline based in Jamaica but was denied the opportunity by Don Wehby, then Audley Shaw’s right-hand man at MOF, because of supposed ‘delicate negotiations’ that were in the works regarding Air Ja. This is the nonsense that has defined governments and governance in Jamaica (for the most part) since Independence. Air Jamaica has not made money since 1969 and it will show a loss this year – again. Air Jamaica could not even make money when Butch Stewart and the Moo-Young family were majority owners in the late 90s to the first half of this decade. I think that any Jamaican who wants to start/run an airline should be able to do so but just not with Jamaican taxpayers’ financial support nor any hopes/expectations of it when times are tough. Using the Boston Consulting Group matrix, Air J is more of a “cash cow” than a “dog”, meaning that it commands a relatively high market share, but has a low growth rate. More people prefer to fly on Air J not only for tourism but for commercial trade, hence the high market share. Because it is a public asset, profit making was never the focus, but public service. When a product or service is considered a “cash cow” the appropriate intervention is restructuring its operations and/or debt but NOT dissolving. The BCG matrix is just one of many tools that are used to develop effective policies and design successful strategic plans. From the field of Operations Research, Linear programming and Time series analysis can be used select the optimal/best routes/hubs as well as the mix of resources needed to attain breakeven or net profit levels. Maybe because the MBA or MPA degrees did not exist in JA until recent years, few decision makers lack the breadth of skills needed to manage troubled assets and/or resolve critical issues. The overriding issue is discipline, from fiscal discipline to disciplined travelers. Air J’s problems are symptomatic of Jamaica’s problems, which cannot be solved by “cutting off our necks to spite our nose” but require careful assessment and effective strategic planning by contemporarily educated Jamaicans. The “chop it down” mentality must be eliminated and replaced with rational-critical thinking. Ignoramuses, philanders, and drunkards must not head public agencies or be allowed to influence public decisions. Is that a new definition of cash cow? It used to be a product or a business unit that generates unusually high profit margins. Richard, could you please post a link or some stats to show the percentage of tourist traffic transported to Jamaica by Air J – for the carrier and against all carriers? I’ve been searching for this info with no luck. Thanks. It is not a new definition; as per the BCG, there are two axes (i.e., relative market share and market growth rate) which range from low to high. The “cash cow” represents a product, service, or organization that has a high market share but has a low market growth rate. A unit can represent a single product/service within an organization or the entire organization that has multiple products/services or a single product/service. If we dissolve or under fund a “cash cow” such as Air J, a huge chunk of JA’s market share will be lost as opposed to dissolving a “dog” that has low market share AND low growth rate – in that case the decision would be to offer a different product/service due to low demand or dissolve. Additionally, informal commerce and remittances (cash or kind) we depend on will suffer. To burden the country with Air Jamaica, is like mandating a young man to buy fine stuff for a girl week after week that he has no hopes of ever getting even a “chuups” from. The sooner Air Ja. is sold, given away or just wound, up the better. I’m not so sure that Air Jamaica is a cash cow. What it has been is primarily a (misplaced?) source of pride for the common man/woman in Jamaica and a money pit. The problem you have is that the government decided to get involved in a business venture it should not have been in. There is pride that comes from starting and owning a business and there there is pride and satisfaction that comes from starting and owning a business that is thriving, profitable and not drowning in debt. Air Jamaica has been a going concern not because it’s a cash cow but because it’s a ward of the Jamaican state. The plain, simple, ugly and inconvenient truth is that if AJ had been a private company from the start it would have likely ceased to exist years ago. AJ had a stint as a private company for almost 10 yrs and the owners failed to reverse its fortunes and they handed it back to the gov’t. There comes a time when certain events happen in the life of a country and priorities have to be (re)considered and certain decisions made. This is one of those times. Richard, you’re right that fixing a ‘cash cow’ should involve restructuring its ops and debts but that’s all the more reason for the private sector to do it and not the gov’t. Let fixing AJ’s problems/issues be someone else’s responsibility – just not the government’s/Jamaican taxpayers. Probably because of a major power surge and a thunderstorm on February 12, I had to split my Friday comment. The second part of my comment that gave sources on Air J’s market share, profitability, and opportunities for growth is still “awaiting moderation” along with a third comment that gave more sources to bolster my position. The sources I found give a contrary view to premise of this article and certain comments. They show that Air J is viable and still holds a leading market share, but is suffering due to liberalization and failed attempts at privatization plus governmental bungling. Ergo, it is not Air J that failed but a JLP government that wants to shirk its responsibilities. Running a national airline is not like running a private bus, taxi, or handcart. Depending on access to equity or debt financing (or ability to turn an existing asset into a transport concern), a single individual may easily join the many individuals and/or groups in those forms of transportation, and breakeven in less than a year with good management. The same is not true for an airline, which requires a high level of investment that few individuals/groups have. Further, the infrastructure (e.g., airports, baggage, security, immigration, customs) to sustain air services (whether local or foreign airlines) must be properly managed and are subject to the US’ FAA regulations and penalties. Along with the direct and indirect contributions to the formal and informal JA economy, Air J with its signature brand and JA Diaspora supported market niche is bonded to our Tourism industry. It is because of this bond, that our government must maintain a 25% to 33% share in our national airline along with an expanded staff share. Great post and discussion. Too many people are blinded by emotion.